Comments: Southern flying squirrels live in woodpecker holes and tree cavities. They cannot fly, but they can "glide" up to 300 feet due to a web of skin extending from their front to hind legs. When gliding they appear flat and square with a flattened tail that provides an efficient rudder to control their aerial maneuvers. Before landing the tail flips upward and the squirrel lands, hind feet first, with his head up. Females produce two litters of 1-7 young. Longevity in the wild is up to six years. 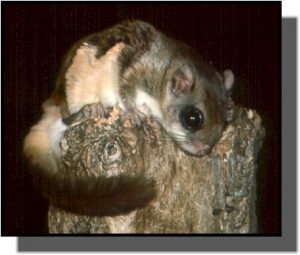 Distribution: Southern flying squirrels can be found in thickly wooded areas from Central America through the eastern half of the United States and into southeast Canada. They are found in oak-hickory forests in the eastern quarter of Kansas. Food: Southern flying squirrels forage at night on nuts, seeds, leaf and flower buds, berries, insects, nestling birds, bird eggs, and carrion.